Build a protected people counter for $30 using an ESP8266, NodeMCU and Ubidots. A people counter is a device used to measure the number of bodies traversing an entrance, hallway, street corner, etc. If you need to know how many people exist in a space - this is your simple solution. Typically used in retail stores, large events,, and smart office buildings, this counting technology has provide insights to both the number of bodies in an environment and how they are behaving in said environment. How is the people counter application applicable to you (other than just being really cool technology)? Imagine you're the store owner; this counter can alert you to daily visitors, the walking paths taken, most frequent stopping points,, and how long a person lingers in a place. Wouldn't you like to know what materials/products gain the most attention? With this sinsight a marketer can reposition products geographically to increase awareness. This, benefiting your customers needs and your bottom line. In this guide you will learn how to build your own home-made people counter. Also included are instructions for your newly collected data to be utilized via Ubidots, an application enablement platform. Because the PIR motion sensor is very sensitive to movement, I used a jumper switch behind it to set the lowest sensibility. I also painted over the lense corners to focus on one specific space instead of omnidirectional. (This was for my liking, but please explore and innovate as you see fit) The results of these few extra minutes of work result in the a friendly, contained device pictured below. 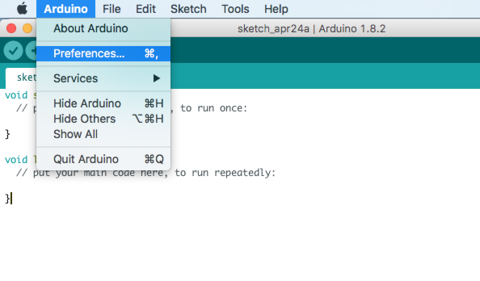 1.- Open the Arduino IDE, select File -> Preferences. Next, input the following URL into the Additional Board Manager URLs text box. You can add multiple URLs by separating them with commas, if needed. 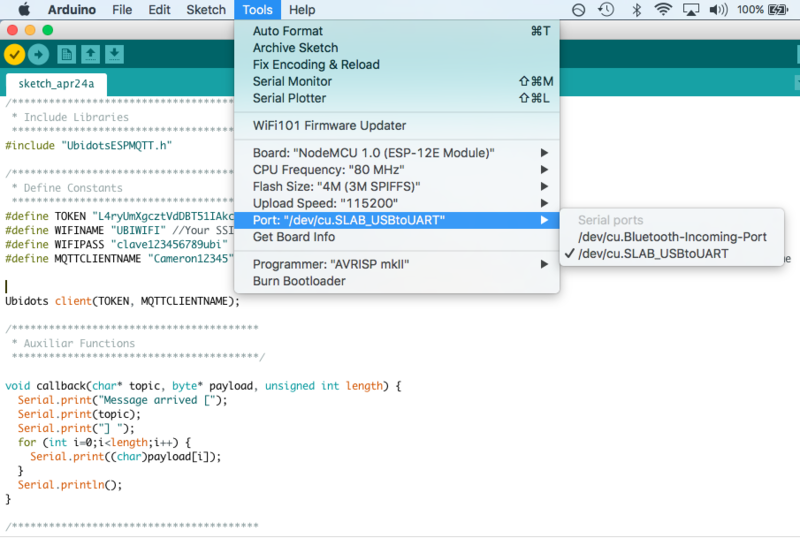 NOTE: If you're a Mac user, please note that Arduino contains different drop down functions compared to Windows operating system. 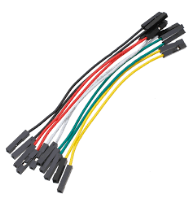 Also, you will need to install the following driver to be able to upload your NodeMCU. 2.- Open Boards Manager from Tools -> Board menu and install ESP8266 platform. To simply find the correct device, search ESP8266 within the search bar. 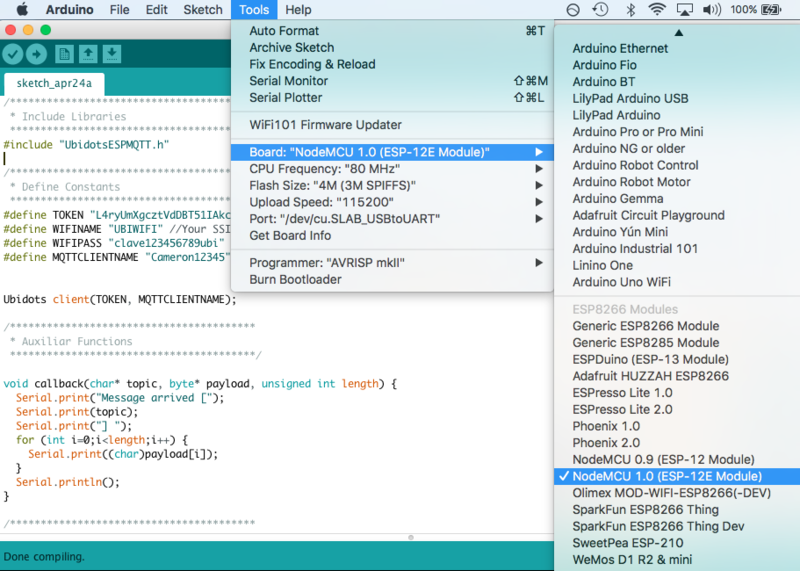 3.- Select your NodeMCU 1.0 (ESP-12 Module) from Tools > Board menu. 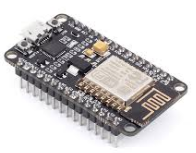 Additionally, we need to be able to communicate with the NodeMCU; select the correct port com for your device. 4.- Next we need to download the Ubidots MQTT ESP library from Github. 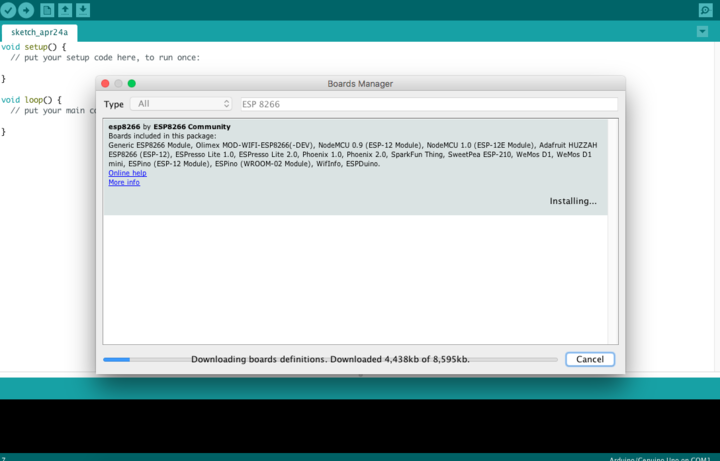 To do this, open the MQTT ESP library here, download the library by clicking the green button called "Clone or download" and select "Download ZIP". 7.- Next, go to Sketch/Program -> Include Library -> Library Manager and install the PubSubClient library. To simply find the correct library, search PubSubClientwithin the search bar. 8.- Close the Arduino IDE and open it again. This restart is required. Please do not miss this step!! Once you have copied the code, you will need to assign the parameters: Wi-Fi name and password, plus your individual, unique Ubidots TOKEN. If you don't know how locate your Ubidots TOKEN, please reference this article below. 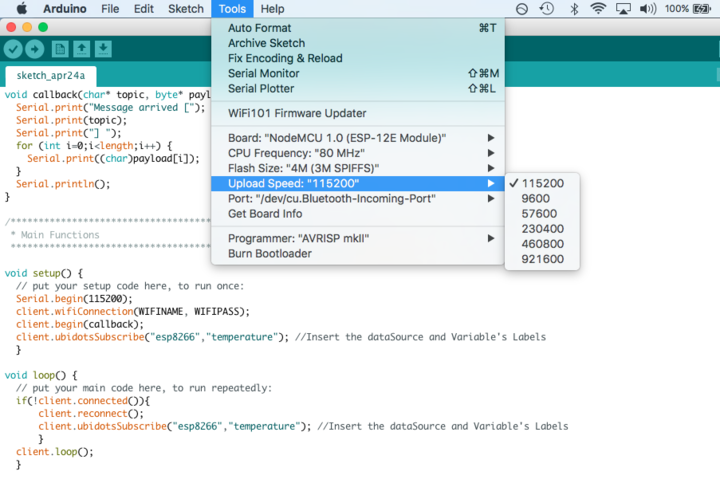 Once you pasted the code and updated the WiFi parameters, you must Verify this within the Arduino IDE. To do this, in the top left corner of our Arduino IDE you will see the below icons. Choose the Check Mark icon to verify any code. Next, your have to upload the code into your NodeMCU. To do this, choose the right-arrow icon beside the check mark icon. Now your sensor is sending the data to the Ubidots Could! 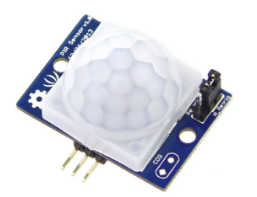 Once your code is uploaded, the onboard LED will alert you the devices connectivity. LED on -> Ok, device connected and sending data. LED blink (1 second) -> Trying to reconnect. Lost the connection. No acces to internet. If your device is correctly connected you will see a new device created within your device section in your Ubidots application. 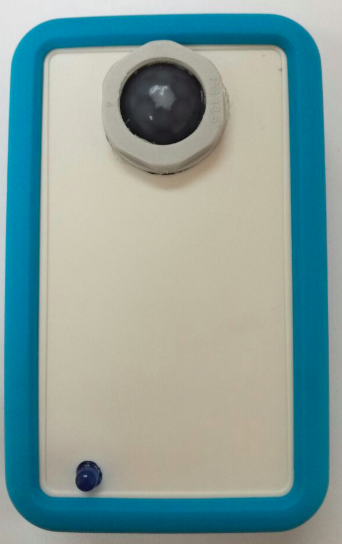 The name of the device will be "sensor-pir", also inside the device you will see the variable created called "motion." Next, to count the amount of people your device is detecting, we need to create a new derived variable to be able to manage the data and count the amount of people detected. Select the device called "pir-sensor" and the variable "motion" then, compute the sum every time set as you desire ( 1 minute; 1 hour; 1 day) to get the number of people detected. Press Save and assign a name for the variable. This project educates administrators and decision makers to the amount of people passing through a particular space and how they operate. Please note that not every person will be detected due to limitations of the motion sensor. Line of sight is important for us humans and machines also struggle with this too. But we are working on it! 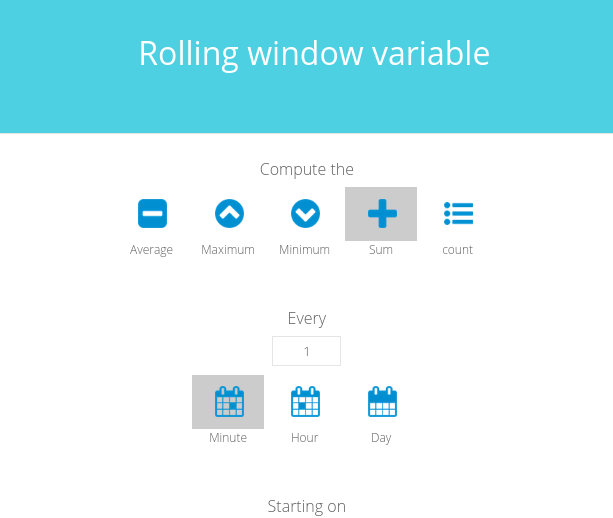 Now it is time to create a dashboard to control and manage the variables of your own People Counter. To learn more about Ubidots widgets and events, check out these video tutorials. This content was originally published in Ubidots Blog on April 28, 2017.